27 October 1934 is a memorable date: on that day Vitosha became the first nature park on the Balkan Peninsula. It is situated on the territory of Vitosha Mountain and attracts thousands of nature lovers, keen hikers and regular people who just want to take a little break from the noise of the big city. Oh, yes, we forgot to tell you that the park is in close proximity to Sofia, the capital of Bulgaria, and can be reached from any location inside the city in no more than 20 minutes. It takes up an area of over 26 000 hectares and comprises two nature reserves: the Turf Reserve and Bistrishko Branishte Reserve. The latter is of particular interest to tourists who have a soft spot for nature because it is home to one of the biggest spruce forests in Bulgaria. All trees there are over 120 years old and up to 35 m tall. In 1977 the reserve became part of UNESCO’s Man and Biosphere Programme. Rila National Park is the largest park in the country. 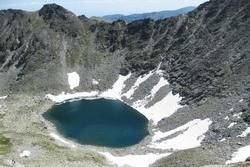 It is hidden in the heart of Rila Mountain, approximately 100 km south of Sofia and covers an area of 81 000 hectares. The park is inhabited by more than 3000 animal and 100 bird species and almost 90% of its territory is taken up by venerable coniferous trees such as spruce, white fur and Scots pine, among others. But that’s not all. It boasts over 120 natural lakes and four reserves: Parangalitsa, Central Rila Reserve, Ibar and Skakavitsa. Parangalitsa is also one of the biosphere reserves under the protection of the Man and Biosphere Programme introduced by UNESCO. The park is a preferred destination for all people who enjoy mountain-related activities. 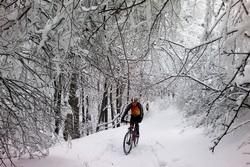 It offers an impressive network of eco trails that vary in difficulty and are accessible throughout the whole year and some great mountain biking routes. This is also where one will find Musala, the highest peak on the Balkans (2925 m) and Borovets, the oldest ski resort in the country established in 1896. Central seems to be the key word here. It lies in the heart of Central Stara Planina (Old Mountain) in the central part of Bulgaria, a couple of hours away from basically every major city in the country. However, the geographical peculiarities are not the thing that makes Central Balkan National Park such a popular tourist destination - its animals, birds, hundreds of trekking routes, rocky peaks, centuries-old coniferous and deciduous forests, mountain biking trails and huts are. 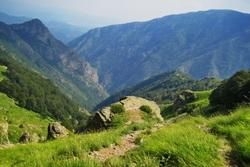 This is one of the three national parks in Bulgaria (the other two are described just above). 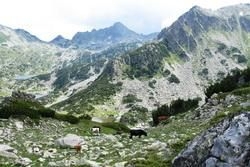 It takes up the bulk of Pirin Mountain in Southwestern Bulgaria and is especially famous for its plant diversity. On its territory one can find more than 1300 plant species, the most interesting of which are the edelweiss – the symbol of the Bulgarian Tourist Union, and Baikushev’s Pine, the oldest and most impressive tree in the country. A huge number of animals and birds live in the park as well: the wild goat and the brown bear are the two rarest species. With a territory of 1161 sq km, Strandzha Nature Park is the largest protected area in the country. It covers a huge chunk of Strandzha Mountain in Southeastern Bulgaria and thanks to its proximity to the Black Sea Coast, it is extremely well visited. This place has managed to preserve the biggest variety of amphibians in Europe and also the most impressive deciduous forests on the continent. It also keeps many rare and ancient Bulgarian customs and traditions alive. The most important protected areas on the territory of the park are the mouth of Veleka River and the wild Silistar Beach. You will find it 50 km down the road from Burgas, the second largest city on the Black Sea shore. It includes Ropotamo River and its beautiful mouth, hundreds of acres of dense forests, Arkutino Swamp, an incredible variety of fish, animal and bird species and the Lion’s Head, an amazing rock formation. It is perfect for all those who love wild nature, bird watching and quiet boat rides along some emerald river full of fish and surrounded by imposing beech, alder and ash trees. Srebarna Nature Reserve is located in the northeastern part of the country, just two kilometres away from the Danube River and 120 km east of Ruse. The most prominent features of this reserve are Srebarna Lake and its birds. Ornithologists claim that more than 170 bird species can be seen in the region of the reserve. 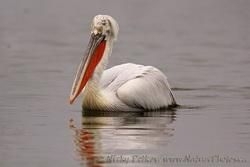 This is due to the fact that Srebarna lies on Via Pontica, the second largest bird migration route in Europe. Every year hundreds of bird watchers go there to enjoy the sight of rare Dalmatian pelicans, mute swans, bluethroats, geese, cormorants and marsh harriers. In 1983 Srebarna Nature Reserve was included in the World Heritage List of UNESCO. This reserve is located near the city of Varna, the sea capital of Bulgaria, in the northern region of the Black Sea Coast. It comprises the lower valley of Kamchia River and just like Srebarna Nature Reserve, it is an excellent destination for bird watchers. More than 250 types of bird live on its territory, including some endangered species such as the lesser spotted eagle, the Eurasian hobby, the European honey buzzard, the black stork, etc. 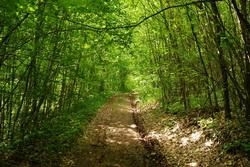 Kamchia Reserve is also home to one of the largest and oldest riverside forests in the country. It is so dense that it is virtually inaccessible and that’s why the only way to explore it is from its heart: the river. 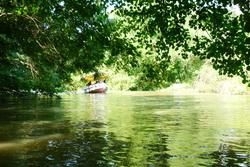 The boat rides down the river are for the tourists who want to really feel the full magic of this natural haven. 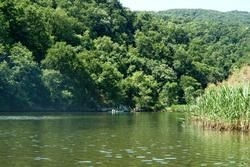 Kamchia Biosphere Reserve is protected by UNESCO.